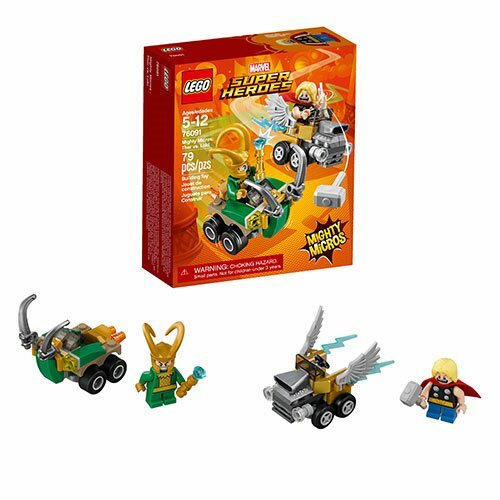 Stage a sibling showdown with this fun LEGO Marvel Super Heroes Mighty Micros: Thor vs. Loki set, featuring Thor's Mighty Micros car with adjustable wing elements and Loki's Mighty Micros car with Viking horn elements. Loki is equipped with a scepter and Thor has his iconic Mjolnir hammer to add to the role-play action. This fun superhero toy for kids includes 2 mini-figures with mini legs. The LEGO Marvel 76091 Mighty Micros Thor vs. Loki includes 79 pieces. Ages 5 to 12.